Insulin dosing based on carbohydrate counting is the gold standard for improving glycaemic control in type 1 diabetes (T1D). 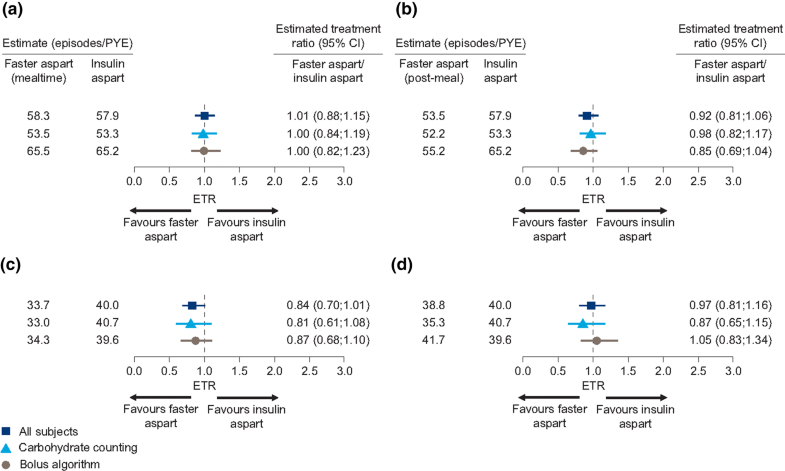 This post hoc analysis aimed to explore the efficacy and safety of fast-acting insulin aspart (faster aspart) according to bolus dose adjustment method in people with T1D. 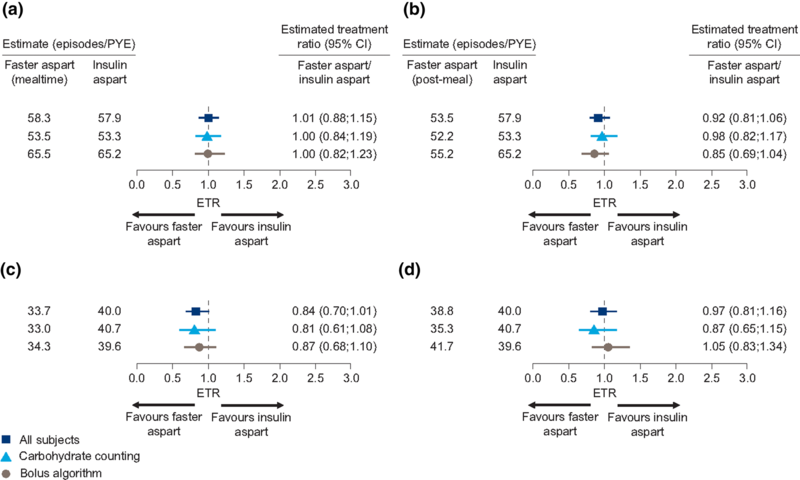 Post hoc analysis of two 26-week, treat-to-target, randomised trials investigating treatment with double-blind mealtime faster aspart, insulin aspart (IAsp), or open-label post-meal faster aspart (onset 1, n = 1143; onset 8, n = 1025). Participants with previous experience continued carbohydrate counting (onset 1, n = 669 [58.5%]; onset 8, n = 428 [41.8%]), while remaining participants used a bolus algorithm. In onset 1, HbA1c reduction was statistically significantly in favour of mealtime faster aspart versus IAsp with carbohydrate counting (estimated treatment difference [ETD 95% CI] − 0.19% [− 0.30; − 0.09]; − 2.08 mmol/mol [− 3.23; − 0.93]). In onset 8, there was no statistically significant difference in HbA1c reduction with either dose adjustment method, although a trend towards improved HbA1c was observed for mealtime faster aspart with carbohydrate counting (ETD − 0.14% [− 0.28; 0.003]; − 1.53 mmol/mol [− 3.10; 0.04]). In both trials, bolus insulin doses and overall rates of severe or blood glucose-confirmed hypoglycaemia were similar between treatments across dose adjustment methods. For people with T1D using carbohydrate counting, mealtime faster aspart may offer improved glycaemic control versus IAsp, with similar insulin dose and weight gain and no increased risk of hypoglycaemia. ClinicalTrials.gov: NCT01831765 (onset 1) and NCT02500706 (onset 8). To view enhanced digital features for this article go to https://doi.org/10.6084/m9.figshare.7873592. The online version of this article ( https://doi.org/10.1007/s13300-019-0608-4) contains supplementary material, which is available to authorized users. Optimising postprandial plasma glucose (PPG) control plays an important role in achieving target HbA1c levels and reducing the risk of diabetes-related complications in people with type 1 diabetes (T1D) [1, 2]. Mealtime bolus therapy aims to mimic the physiological prandial insulin secretion profile to lower PPG excursions without increasing the risk of hypoglycaemia . The manner in which the bolus insulin dose is adjusted is an important aspect of diabetes self-management [4, 5]. Dose adjustment based on carbohydrate counting is considered the ‘gold standard’ approach, and can lead to improvements in glycaemic control without increasing the risk of severe hypoglycaemia in people with T1D [4, 5, 6, 7, 8, 9]. Carbohydrate counting is based on the principle that carbohydrate is the predominant nutrient contributing to the rise in PPG, and involves matching the amount of carbohydrate consumed with an appropriate bolus insulin dose using insulin-to-carbohydrate ratios (ICR). Pre-meal self-measured blood glucose (SMBG) values are also necessary to determine whether additional insulin is needed to correct pre-meal hyperglycaemia. In addition to improving HbA1c , structured training in carbohydrate counting can improve quality of life, treatment satisfaction and psychological well-being [5, 11]. However, there are challenges associated with accurately dosing based on carbohydrate counting, and standardised bolus titration algorithms based on SMBG measurements can also be efficacious . 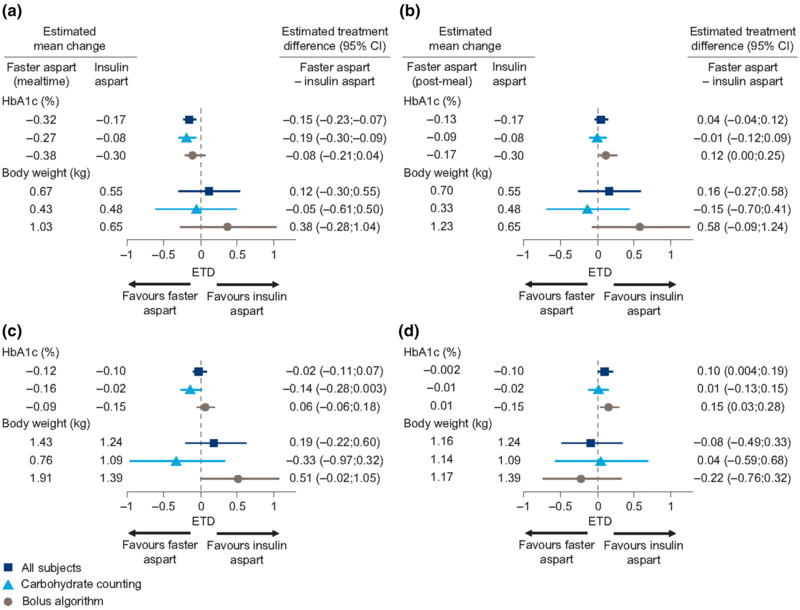 Even with correct dosing, exogenous mealtime insulins are associated with delayed absorption and onset of action compared with physiological insulin secreted from the pancreas , and only a minority of patients with T1D achieve HbA1c targets . A new generation of insulin formulations are being developed to accelerate insulin absorption and improve PPG-lowering action. Fast-acting insulin aspart (faster aspart) is a faster-acting formulation of insulin aspart (IAsp), which has been approved for use by the US Food and Drug Administration and European Medicines Agency. Two large randomised controlled trials, onset 1 and onset 8, have evaluated the efficacy and safety of faster aspart as part of a basal–bolus regimen in adults with T1D. In both the onset 1 and onset 8 trials, mealtime and post-meal administration of faster aspart was non-inferior to mealtime IAsp regarding change in HbA1c after 26 weeks’ treatment [15, 16], and there was a statistically significant improvement in HbA1c in favour of mealtime faster aspart versus IAsp in onset 1 . In both trials, the incidence of overall severe or blood glucose (BG)-confirmed hypoglycaemia, increase in body weight from baseline, and insulin dose 26 weeks after randomisation was comparable between treatments. Using data from onset 1 and onset 8, this post hoc analysis aimed to explore the efficacy and safety of faster aspart according to bolus dose adjustment method (carbohydrate counting and a pre-defined bolus dosing algorithm) in people with T1D. This was a post hoc analysis of two multicentre, active-controlled, randomised, parallel-group trials which evaluated the safety and efficacy of faster aspart (mealtime and post-meal) versus IAsp in adults with T1D over 26 weeks (Fig. S1) (ClinicalTrials.gov: NCT01831765 [onset 1] and NCT02500706 [onset 8]). The trials were similar in design, and the trial methods and efficacy and safety outcomes have been reported previously [15, 16, 17]. Faster aspart and IAsp were administered in a basal–bolus regimen with once- or twice-daily insulin detemir in onset 1 and once-daily insulin degludec in onset 8. The onset 1 trial was conducted at 165 sites across Belgium, Canada, Czech Republic, Finland, Germany, Hungary, Poland, the UK and the USA. The onset 8 trial was conducted at 146 sites across Austria, Bulgaria, Canada, Germany, India, Israel, Italy, Japan, Russian Federation, Serbia, Taiwan and the USA. All procedures performed in studies involving human participants were in accordance with the ethical standards of the institutional and/or national research committees and with the Helsinki declaration and its later amendments or comparable ethical standards. Informed consent was obtained from all individual participants included in the studies. See Supplementary Material for a full list of the ethics committees/institutional review boards that approved this study. In both trials, adults (at least 18 years old; at least 20 years in Japan and Taiwan) with T1D were eligible for inclusion if treated with a basal–bolus insulin regimen for at least 12 months before screening, including a basal insulin analogue for at least 4 months before screening, with an HbA1c of 7.0–9.5% (53–80 mmol/mol) and a body mass index of at most 35.0 kg/m2. Exclusion criteria included any use of an antidiabetic medication other than insulin within 3 months prior to screening; for additional exclusion criteria, see Buse et al. and Russell-Jones et al. . In both trials, after an initial 2-week screening period, an 8-week run-in period allowed for optimisation of basal insulin. At the start of the run-in period, participants were switched from their pre-trial bolus insulin to IAsp. Bolus dose was adjusted using the same method used before the trial, and no titration was performed by the investigator unless necessary for safety reasons. Following the run-in period, participants were randomised 1:1:1 to receive double-blind mealtime faster aspart or mealtime IAsp, or open-label post-meal faster aspart. In both trials, mealtime dosing was defined as bolus insulin injected 0–2 min before the start of a meal. In onset 1, post-meal dosing was defined as bolus insulin injected at a fixed time of 20 min after the start of the meal. In onset 8, post-meal dosing was defined as bolus insulin injected at the end of a meal, and no later than 20 min after the start. Both trials employed the same bolus dose adjustment methods during the treatment period. Participants who were assessed by the investigator to be adequately trained in carbohydrate counting continued using this method. All other participants used a predefined bolus-dosing algorithm (Table S1). For participants following the principles of carbohydrate counting, meal carbohydrate content and pre-prandial plasma glucose (PG) values were used to determine the appropriate bolus insulin dose. Adjustments were made several times daily by the participant in accordance with the ICR and insulin correction factor. A weekly review of the ICR and insulin correction factor was performed by the investigator on the basis of individual participants’ SMBG assessed using a glucose meter calibrated to plasma equivalent glucose values. The target pre-prandial PG range was 4.0–6.0 mmol/L. In case of hypoglycaemic episodes, the dose could be reduced at the investigator’s discretion. For participants using the predefined bolus-dosing algorithm (Table S1), bolus titration was to the next pre-prandial PG target of 4.0–6.0 mmol/L for both breakfast and lunch doses, and to the same target at bedtime for the dinner dose. Dose adjustments were made twice weekly on the basis of SMBG measured during the previous 3–4 days: once by the investigator and once by the participant. The primary endpoint in both trials was the change from baseline in HbA1c 26 weeks after randomisation. The full list of secondary endpoints in each trial has been published [15, 16]. This analysis used change in body weight from baseline, total insulin dose and bolus insulin dose, and severe (as defined by the American Diabetes Association ) or BG-confirmed hypoglycaemic episodes (PG value less than 3.1 mmol/L with or without symptoms consistent with hypoglycaemia) as secondary endpoints of interest. Meal-related hypoglycaemia was evaluated both in terms of the cumulative rate within 1, 2 and 4 h after the start of a meal, and the non-cumulative rate during the > 1 to 2, > 2 to 3 and > 3 to 4 h periods after the start of a meal. For the post hoc analysis, participants were grouped on the basis of dose adjustment method at baseline: carbohydrate counting and bolus algorithm. Owing to the different basal insulin components and the larger proportion of Asian participants in onset 8, results of the post hoc analysis are reported separately for each trial. In both trials, changes from baseline in HbA1c and body weight were analysed using regression models, including treatment, region and strata as fixed effects and baseline values as covariate. Stratification included bolus adjustment method, basal insulin regimen, and exploratory PPG control assessment method in onset 1, and bolus adjustment method in onset 8. The overall (non-subgroup) analyses, as pre-specified in the protocols, took into account dropout bias by formulating regression models as mixed-effect model for repeated measures (MMRMs) (onset 1) or by using multiple imputation (onset 8). In onset 1, information until discontinuation of randomised treatment was included, whereas in onset 8, all available information regardless of discontinuation from randomised treatment was included. 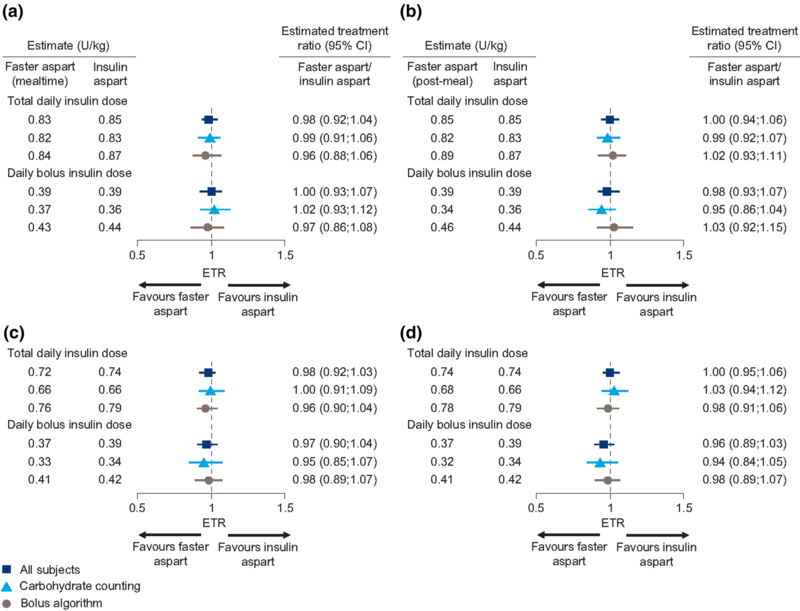 Log total dose and bolus insulin dose were analysed using linear regression models (onset 1) or MMRMs (onset 8), and back-transformed to produce dose ratios. Both models included treatment, region and strata as factors. In both trials, the rates of hypoglycaemic episodes were analysed using a negative binomial regression model for the episode count with a log-link function with the logarithm of the time in which the hypoglycaemic episode was considered treatment-emergent as offset. The model included treatment, region and strata as factors. For both trials, results by dose adjustment subgroups were based on MMRMs and were obtained by including a treatment-by-dose adjustment method interaction term in the regression models. In onset 1, 1143 participants were randomised to mealtime faster aspart (n = 381), IAsp (n = 380), or post-meal faster aspart (n = 382), and 1062 (92.9%) similarly distributed across treatment arms completed 26 weeks of randomised treatment. In onset 8, 1025 participants were randomised to mealtime faster aspart (n = 342), IAsp (n = 342) or post-meal faster aspart (n = 341). A total of 1007 (98.2%) participants completed the trial, while 999 (97.5%) completed the 26-week treatment period without premature discontinuation of randomised treatment. A similar proportion of participants completed both the trial and treatment period in each treatment arm. In total, 669 (58.5%) participants in onset 1 and 428 (41.8%) participants in onset 8 adjusted their bolus insulin dose on the basis of carbohydrate counting. Baseline characteristics were similar between treatment arms and within each dose adjustment group in each trial (Table 1). The majority of the participants in onset 1 were White (93.3%) and all were enrolled in North America (59.1%) or Europe (40.9%). The majority of participants in onset 8 were White (60.8%) or Asian (37.5%) and were enrolled in Europe (33.7%), North America (29.4%), Japan (23.9%) and Asia (excluding Japan) (13.1%). In onset 1, non-inferiority (0.4% margin) of both mealtime and post-meal faster aspart to IAsp in terms of HbA1c reduction was confirmed (estimated treatment difference [ETD], mealtime − 0.15% [95% CI − 0.23; − 0.07]; − 1.62 mmol/mol [− 2.50; − 0.73]; post-meal 0.04% [− 0.04; 0.12], 0.47 mmol/mol [− 0.41; 1.36]; p < 0.0001 for non-inferiority) . HbA1c reduction was statistically significantly greater for mealtime faster aspart compared with IAsp (p = 0.0003). In onset 1, HbA1c reduction was statistically significantly greater with mealtime faster aspart versus IAsp in the carbohydrate counting group (ETD − 0.19% [95% CI − 0.30; − 0.09]; − 2.08 mmol/mol [− 3.23; – 0.93]) (Fig. 1), and there was no significant difference between post-meal faster aspart and IAsp. There was also no statistically significant difference between treatments in the bolus algorithm group. In onset 8, change in HbA1c was not statistically significantly different between treatments in either dose adjustment group. The ETD for change from baseline in HbA1c was − 0.14% (95% CI − 0.28; 0.003; − 1.53 mmol/mol [− 3.10; 0.04]) in the carbohydrate counting group and 0.06% (95% CI − 0.06; 0.18; 1.69 mmol/mol [0.38; 3.01]) in the bolus algorithm group (Fig. 1). Change in HbA1c was statistically significantly different in favour of IAsp versus post-meal faster aspart in the bolus algorithm group (ETD 0.15% [95% CI 0.03; 0.28]; 1.69 mmol/mol [0.38; 3.01]). There was no statistically significant difference in change in body weight from baseline between faster aspart (mealtime and post-meal) and IAsp across dose adjustment groups in either trial (Fig. 1). In both trials, total insulin dose and bolus insulin dose 26 weeks after randomisation were similar between treatment arms across dose adjustment groups (Fig. 2). In both onset 1 and onset 8, there was no statistically significant difference in the overall rates of severe or BG-confirmed hypoglycaemic episodes between faster aspart (mealtime or post-meal) and IAsp across dose adjustment groups (Fig. 3) [15, 16]. Of note, although an indirect comparison, the rates were numerically lower in the onset 8 trial compared with the onset 1 trial. In onset 1, a statistically significantly higher hypoglycaemia rate was observed within 1 h after a meal with mealtime faster aspart versus IAsp in the bolus algorithm group (Rate Ratio (RR) 1.91 [95% CI 1.23; 2.99], but there was no significant difference in the carbohydrate counting group (RR 1.15 [95% CI 0.80; 1.65]) (Fig. 4a). No significant differences between treatments were observed in the cumulative rates 2 and 4 h after a meal (Fig. 4a, b), or in the non-cumulative rates of hypoglycaemia > 1 to 2, > 2 to 3 or > 3 to 4 h after a meal across dose adjustment groups (Fig. S2a, b). In onset 8, there was a significantly lower cumulative rate of hypoglycaemia 4 h after a meal with mealtime faster aspart versus IAsp in the carbohydrate counting group (RR 0.62 [95% CI 0.41; 0.93]), along with a trend in favour of mealtime faster aspart at 1 and 2 h (Fig. 4c). There was also a significantly lower non-cumulative hypoglycaemia rate in the > 3 to 4 h period after a meal with mealtime faster versus IAsp in the carbohydrate counting group (RR 0.54 [95% CI 0.35; 0.84]) (Fig. S2c). There was no significant difference in the rate of hypoglycaemia at each time point after a meal (cumulative and non-cumulative) between treatments in the bolus algorithm group (Fig. 4 and Fig. S2). Mealtime and post-meal faster aspart provide effective glycaemic control compared with IAsp in people with T1D [15, 16]. 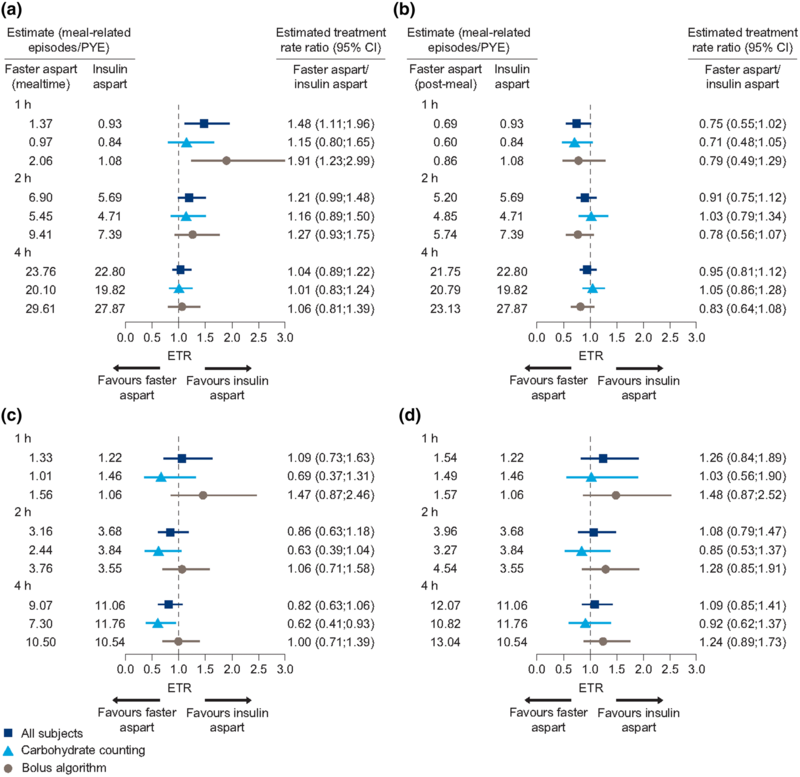 This post hoc analysis aimed to explore the efficacy and safety of faster aspart according to bolus dose adjustment method using data from the onset 1 and onset 8 trials. In onset 1, there was a statistically significant improvement in HbA1c with mealtime faster aspart versus IAsp in participants using carbohydrate counting. Although there was no statistically significant difference in HbA1c reduction between treatments with either dose adjustment method in onset 8, there was a trend towards improved HbA1c in the mealtime faster aspart carbohydrate counting group. In both trials, body weight change, insulin dose and overall hypoglycaemia rates were similar between faster aspart (mealtime and post-meal) and IAsp with both dose adjustment methods. In the previously reported onset 1 trial, there was a significant reduction in meal-related hypoglycaemia observed 1 h after a meal in favour of IAsp versus mealtime faster aspart [15, 16]. While there was no significant difference between treatments at this time point in onset 8, there was a significant difference in hypoglycaemia in the 3–4 h period in favour of mealtime faster aspart versus IAsp . Differences in timing of hypoglycaemia are likely to be related to the distinct time–action profile of faster aspart relative to IAsp . In this analysis, the treatment difference at 1 h in onset 1 was attenuated in the carbohydrate counting group, and there was a trend in favour of mealtime faster aspart at each time point after a meal in the carbohydrate counting group in onset 8, with significant differences at 4 h and during the 3–4 h period. The analysis may indicate that for patients able to adjust their insulin dose using carbohydrate counting, post-meal hypoglycaemia risk is the same or lower with mealtime faster aspart compared with mealtime IAsp. There are limitations to this study. Participants were not randomised to a dose adjustment method. Participants continued to use the same method for bolus adjustment as they did before the trial. Those who were assessed to be adequately trained in carbohydrate counting continued using this method. This was also a post hoc analysis and so can only be considered hypotheses generating. However, the trend towards improved HbA1c with mealtime faster aspart versus IAsp in participants using carbohydrate counting was consistent across two large, multicentre clinical trials with similar study designs and the same dose adjustment protocols. There were some differences between the two trials. The trials used different basal insulin components (insulin detemir in onset 1 and insulin degludec in onset 8). In particular, the use of insulin degludec as the basal insulin component may have contributed towards the numerically lower rates of hypoglycaemia observed in onset 8 compared with onset 1 [20, 21, 22]. The trials also had different participant populations, with a higher proportion of Asian participants in onset 8, and cultural and dietary differences might have contributed to the heterogeneity between the trials. Carbohydrate counting is a recommended approach for improving glycaemic control in T1D [8, 23]. Adjusting bolus insulin dose based on ICR and correction factors enables relatively precise matching to prandial insulin needs, increasing dietary freedom . However, inaccurate carbohydrate counting is frequent [24, 25], and is associated with higher glucose variability in adults with T1D . Some patients may find the complexity of choosing and calculating pre-meal insulin doses too difficult, or may not adjust their dose because of fear of hypoglycaemia . It should be noted that standardised titration algorithms are also considered a safe and efficacious approach for patients with T1D . Regardless of bolus insulin adjustment method, mealtime and post-meal faster aspart provide effective glycaemic control in terms of HbA1c reduction. 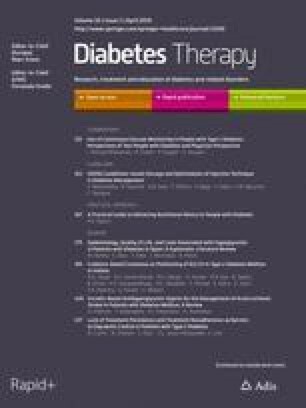 The results of the post hoc analysis suggest that for people with T1D who are able to adjust their dose on the basis of carbohydrate counting, mealtime faster aspart may offer improved glycaemic control compared with IAsp, with similar daily total and bolus insulin dose, and without an increased risk of overall or meal-related hypoglycaemia. We thank all investigators, trial staff and participants of these studies. The onset 1 and onset 8 trials were sponsored by Novo Nordisk. Novo Nordisk provided financial support for the conduct of the analysis and preparation of the article, and funded the article processing charges. All authors had full access to all of the data in this study and take complete responsibility for the integrity of the data and accuracy of the data analysis. Medical writing and submission support were provided by Helen Parker PhD and Erin Slobodian of Watermeadow Medical, an Ashfield Company, part of UDG Healthcare plc, funded by Novo Nordisk. All named authors meet the International Committee of Medical Journal Editors (ICMJE) criteria for authorship of this manuscript, take responsibility for the integrity of the work as a whole, and have given their approval for this version to be published. LR, TK, TP, KB, ME, AGR and APT all provided critical input into the manuscript and approved the final manuscript for submission. AGR was the responsible statistician. Data analysed in this paper have been previously presented in poster form at the American Association of Diabetes Educators—45th Annual Meeting and Exhibition (AADE 2018), Baltimore, MD, USA; American Diabetes Association—77th Annual Scientific Sessions (ADA 2017), Orlando, FL, USA; European Association for the Study of Diabetes—53rd Annual Meeting (EASD 2017), Lisbon, Portugal; Endocrine Society of Australia/Society for Reproductive Biology—2017 Joint Annual Meeting (ESA/SRB 2017), Perth, Australia; International Diabetes Federation—24th World Diabetes Congress (IDF 2017), Abu Dhabi, UAE; Sociedade Brasileira de Diabetes—XXI Congresso (SBD 2017), Sao Paulo, Brazil; Societe Francaise d’Endocrinologie—34th Annual Congress (SFE 2017), Poitiers, France; Societa Italiana di Diabetologia—Congresso 27 (SID 2018), Rimini, Italy; and Societe Francophone du Diabete—44th Congres Annuel (SFD 2018), Nantes, France. Data analysed in this paper have also been presented in oral presentation form at Canadian Diabetes Association/CSEM 21st Annual Professional Conference and Annual Meetings (CDA 2018), Halifax, Canada; and Diabetes UK Annual Professional Conference 2018 (DUK 2018), London, UK. Data analysed in this paper have been published by Deutsche Diabetes Gesellschaft—53rd Jahrestagung (DDG 2018), Berlin, Germany, in Diabetologie und Stoffwechsel. 2018;13(Suppl 1):S31. Ludger Rose has participated in advisory panels for Novo Nordisk; and acted as a consultant for and is a member of the Association of Statutory Health Insurance Physicians. Takashi Kadowaki has received research funding (to his department) from Kowa Pharmaceutical, Mitsubishi Tanabe, MSD, Nippon Boehringer Ingelheim, Novo Nordisk, Ono Pharmaceutical, and Takeda; lecture fees from Astellas Pharma, AstraZeneca, Eli Lilly, Kissei Pharmaceutical, Kowa Pharmaceutical, Mitsubishi Tanabe, MSD, Nippon Boehringer Ingelheim, Novo Nordisk, Ono Pharmaceutical, Sumitomo Dainippon, and Takeda; fees for writing booklets from Eli Lilly; grants and endowments from Astellas Pharma, Daiichi Sankyo, Kissei Pharmaceutical, Kyowa Hakko Kirin, Mitsubishi Tanabe, Novartis, Novo Nordisk, Ono Pharmaceutical, Sanofi, Sanwa Kagaku, Sumitomo Dainippon, Taisho Toyama Pharmaceutical, and Takeda; funds for contracted research from Daiichi Sankyo, Sanwa Kagaku, and Takeda; and funds for collaborative research from Daiichi Sankyo and Novartis. Takashi Kadowaki is a member of the journal's Editorial Board. Thomas R Pieber holds board membership and has received consulting fees from Adocia, Arecor, AstraZeneca, Novo Nordisk, Roche Diabetes Care, and Eli Lilly, and Sanofi; institutional grants from AstraZeneca and Novo Nordisk; and payment for lectures or speakers’ bureaus from Novo Nordisk. Kristine Buchholtz is an employee and stock/shareholder of Novo Nordisk A/S. Magnus Ekelund is an employee and stock/shareholder of Novo Nordisk A/S. Anders Gorst-Rasmussen is an employee of Novo Nordisk A/S. Athena Philis-Tsimikas serves on advisory boards for AstraZeneca, DexCom, Lilly, Novo Nordisk, and Sanofi; and holds stock ownership in Ionis and Novo Nordisk. All procedures performed in studies involving human participants were in accordance with the ethical standards of the institutional and/or national research committees and with the 1964 Helsinki declaration and its later amendments or comparable ethical standards. Informed consent was obtained from all individual participants included in the studies. See Supplementary Material for a full list of the ethics committees/institutional review boards that approved this study. The subject level analysis data sets for the research analysed in the publication are available from the corresponding author on reasonable request.